All three sites hosted public events to honor World Refugee Day on June 20. Photos from the four events that day are posted on the IINE Facebook page. Thank you for making this year’s World Refugee Day a memorable occasion for our clients, volunteers, and supporters. 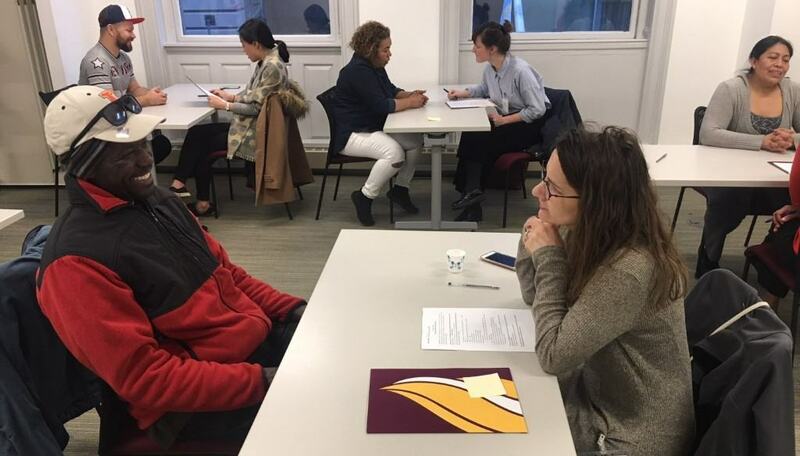 BOSTON – In April volunteers from Life Science Cares (LSC) conducted mock interviews for students in evening ESOL classes in Boston. The LSC group is comprised of volunteers from several different small-to-medium-size biotech companies throughout the region who band together to amplify their impact. Since their Mock Interview Session, LSC has returned the favor and invited IINE staff to present on our work and mission at an upcoming networking meeting of young professionals in the life sciences field. LOWELL – Joan Konuk and Colleen Engel, two dedicated volunteers from Lowell’s English for Employment program, offered a five-week skills training program in Housekeeping & Laundry. 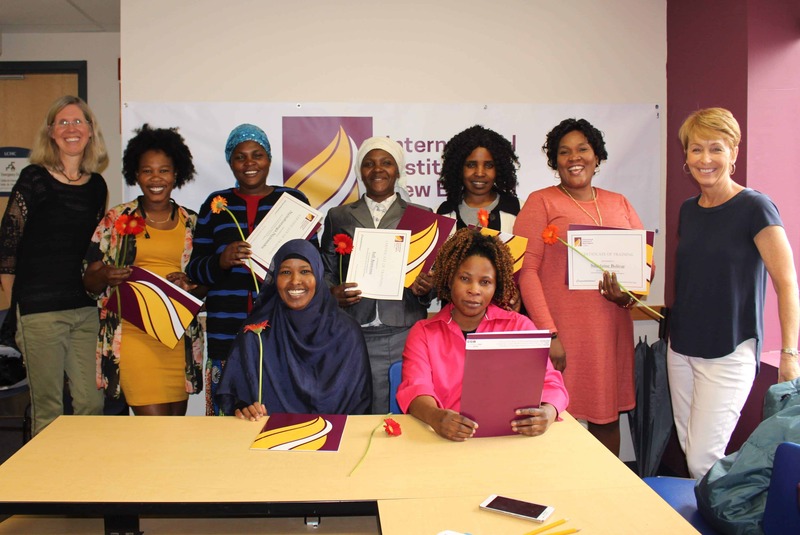 Eight students participated in the program, which started with a visit to the UMass Inn & Conference Center to tour their housekeeping and laundry facilities On Monday, June 4th, the clients showcased what they learned in the program and received certificates of completion. help recently arrived refugees. 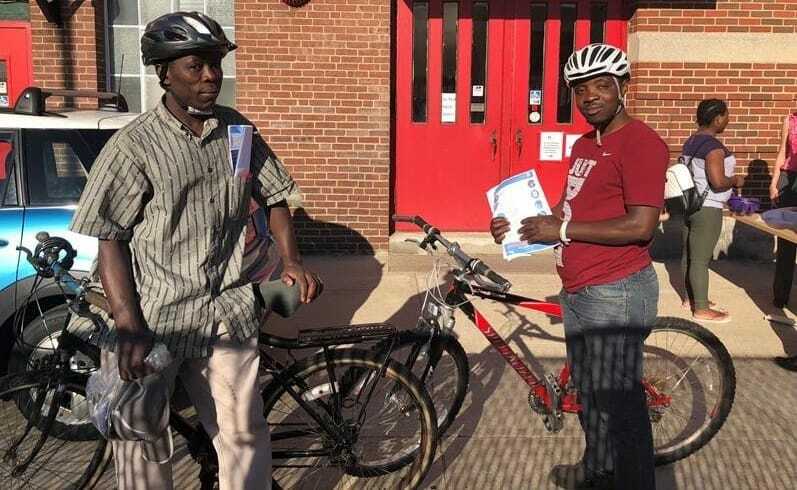 MANCHESTER – Just this week in Manchester, Danah Hashem’s “Seacoast Resettle Together” group and Calvin Wels hosted a bicycle drive to help 12 clients access good, safe bikes. The volunteers provided gently used bikes and new helmets, and hosted a safety training. The drive was an initiative of a group of volunteers from the eastern part of New Hampshire who focus on projects that help recently arrived refugees. SUITCASE STORIES – Throughout the spring, the ongoing Suitcase Stories performance series kept local audiences enthralled with true stories of inspiration and perseverance. Our thanks to all the storytellers who participated in the most recent Weston, Hingham, and Boston performances. 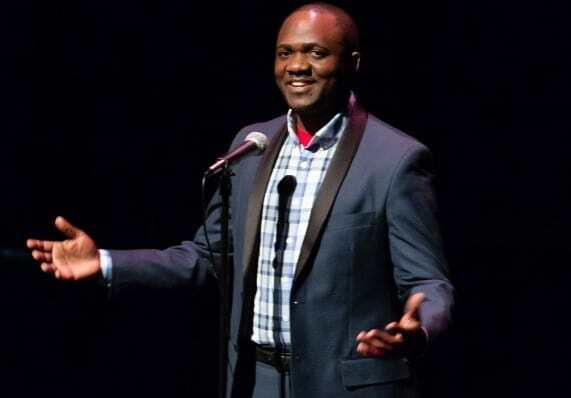 To date, more than 2,500 people have seen a live Suitcase Stories show. There’s just one more show left in 2018 – and that’s coming up in Manchester on Sunday, September 30!